Whether you need cheering up on a dreary cloudy day or just want to celebrate the summer sun, these awesome sun crafts for kids are the perfect choice. Decorate your windows or your walls with one of these crafts so the sun can shine all day long! 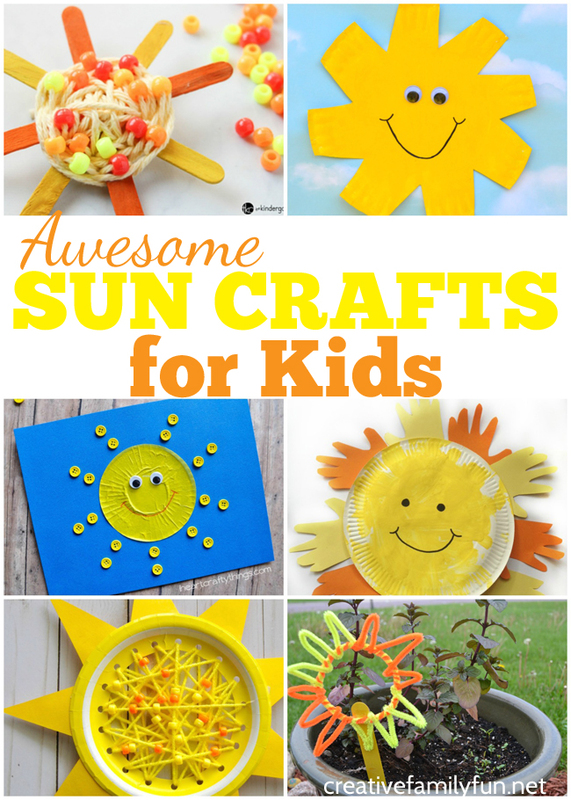 These sun crafts are great for kids of all ages. You’ll find some that are appropriate for toddlers (check out the fork-painted suns), fun for preschoolers (like the recycled cd sun), or fun for older kids (like our piper cleaner sun plant stake). Choose one to make with your kids for a fun way to brighten your day. Create some pretty fork-painted suns like these from I Heart Crafty Things. 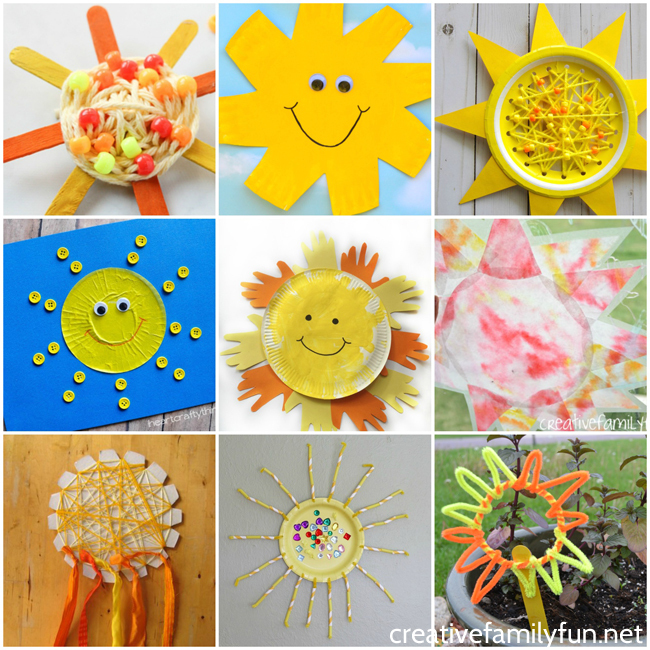 Use a paper plate to make this friendly sun from The Resourceful Mama. Exercise your fine motor skills with this paper plate sun from Buggy and Buddy. Do some simple weaving to make this pretty Sunshine Sewing Craft from I Heart Crafty Things. Try squish painting to make this pretty sun from 123 Homeschool 4 Me. Use a cupcake liner to make this cute sun from I Heart Crafty Things. This paper plate sun from The Kindergarten Connection is super-cute and easy to make. Make this simple sun from Look We’re Learning with a coffee filter. Recycle an old cd and turn it into this fun sun craft from The Kindergarten Connection. You’ll catch yourself singing “You Are My Sunshine” while you make this sweet sun from The Soccer Mom Blog. Celebrate summer with this pretty Sun Suncatcher from Rainy Day Mum. Use simple materials to make this Bright Sunshine Craft from Preschool Toolkit. Use your handprints to make this friendly sun from Crafts on Sea. Weave and wind ribbon and yarn to make this pretty sun from NurtureStore. This easy beaded sun from The Kindergarten Connection is great for fine motor skills and turns out so pretty. 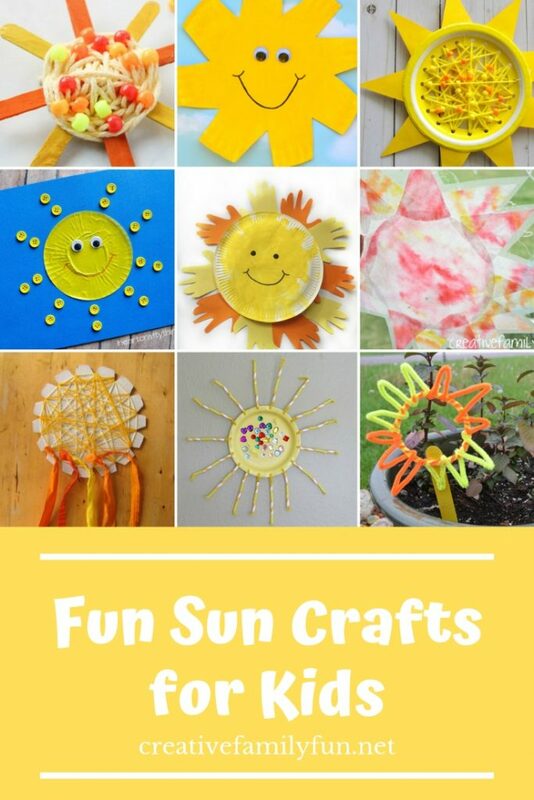 Which of these sun crafts do you want to make with your kids?